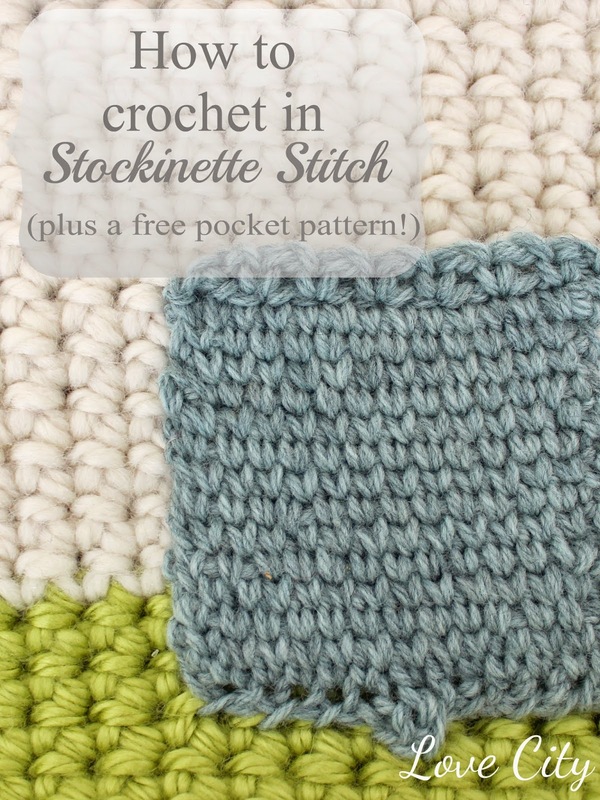 Today, I thought I'd share a fun little technique that will allow you to crochet in stockinette stitch! If you aren't familiar with stockinette stitch, it is a basic stitch in knitting that creates rows of cute little "v" shapes. I have been trying my hand at knitting for about a year, and I still find it pretty tricky! I love the look of knit-wear much more than I do with crochet, so when I find a way to make my crochet work look like it was knit, I get pretty excited! It's like a little short-cut. I made this crochet zipper clutch a while ago, but haven't shared it because it just didn't feel "done." Once I added this pocket applique on it, I like it a lot more! I plan to share the pattern for the clutch eventually but for today, let's focus on the little stockinette stitch pocket! 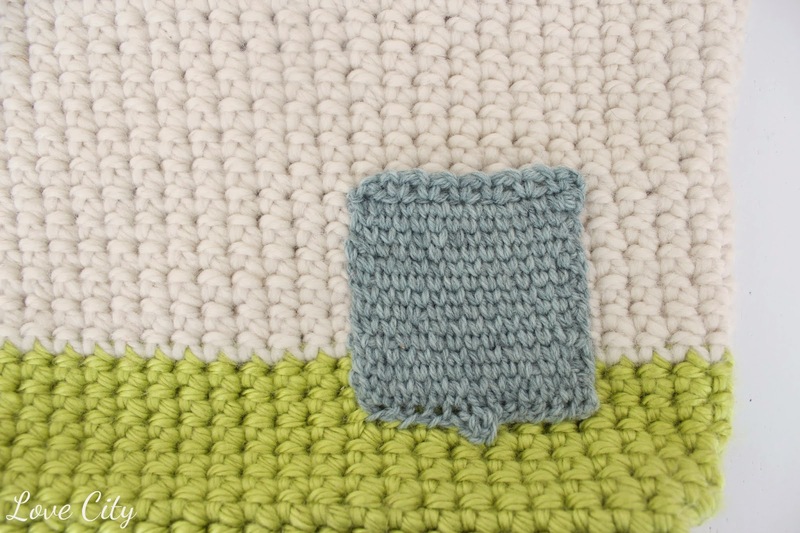 To create the rows of "v's" similar to the knitted stockinette stitch, you will need to work in single crochets. 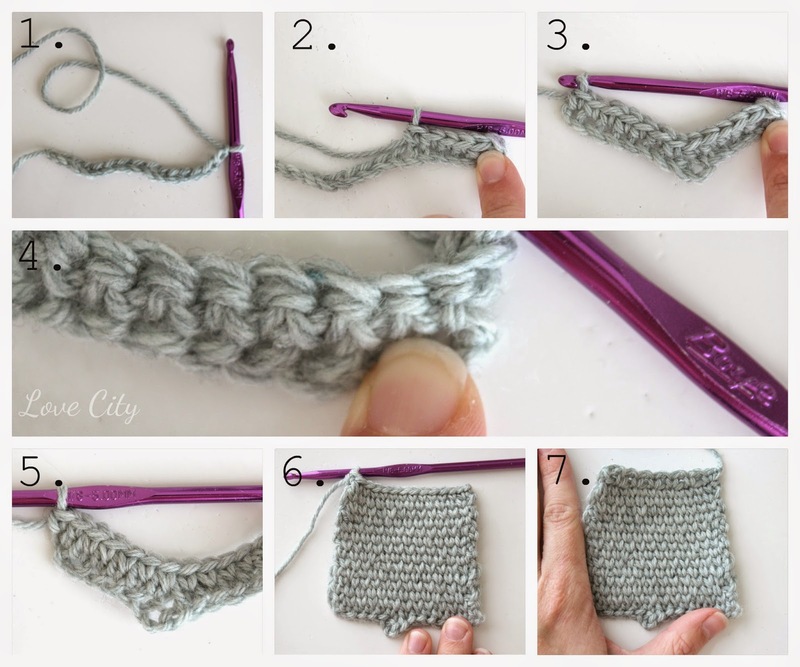 With each single crochet, instead of working the hook into the top of the stitch, you will place the hook into the middle of the stitch (shown with my finger in step 4 below). 2. Sc into the 2nd ch from hook and in the next 5 sts. 3. Skip next 2 sts. Sc in last 7 sts. 4. Turn. Ch 1. Sc into middle of next st (as shown in step 4 of photo above). 5. Continue to sc in this manner in each st across. 6. Repeat until you have reached your desired pocket height. 7. Turn. Ch 2. Skip next st. Sc (in top of stitch now) in next st. *Ch 1. Skip next st. Sc in next st. Repeat from * until you reach the end of the row. Fasten off, leaving long tail for sewing pocket onto garment. 8. Sew pocket onto garment, making sure not to sew top edge...because well...then it wouldn't be a pocket, would it? 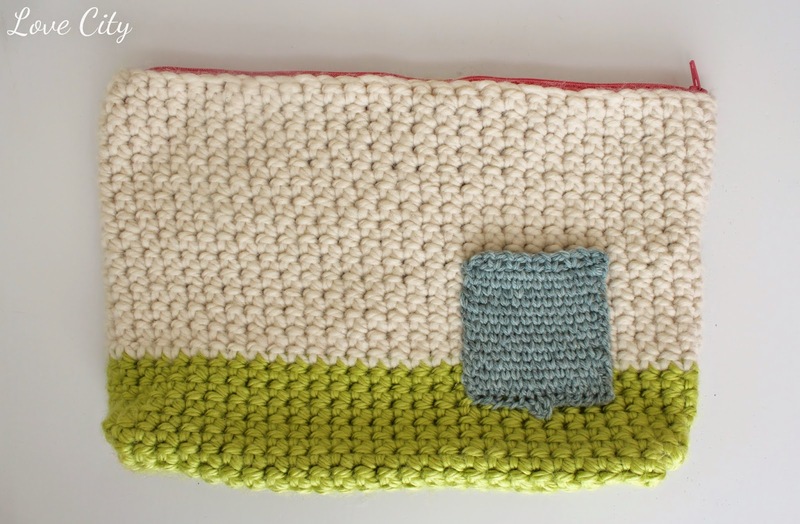 I think it would be pretty fun to use this technique to make a baby or child size blanket. 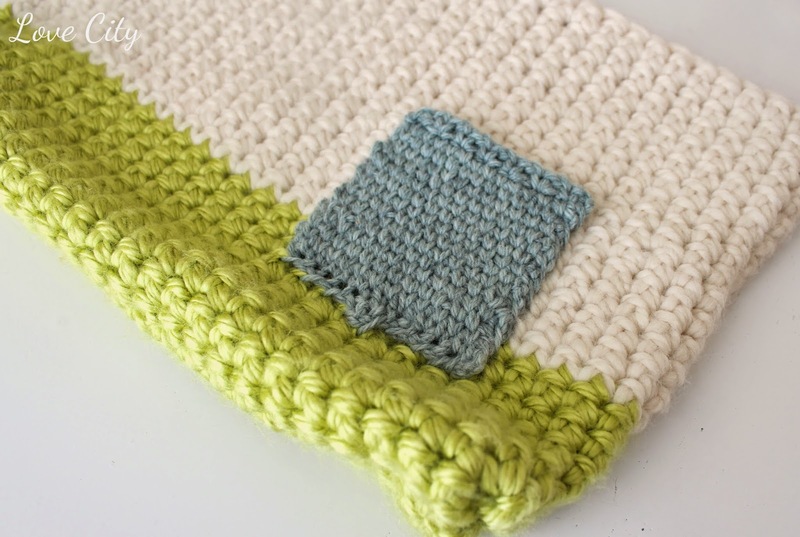 I would use a smaller yarn like a worsted weight with a bigger than suggested crochet hook. When you use a smaller hook, this stitch is very tight and tends to curl up a bit on the edges, so I wonder if it would be a little more loose and less curly with a bigger hook!? What do you think? I also used this pocket pattern to add a fun detail on my latest pattern for I'm Topsy Turvy! 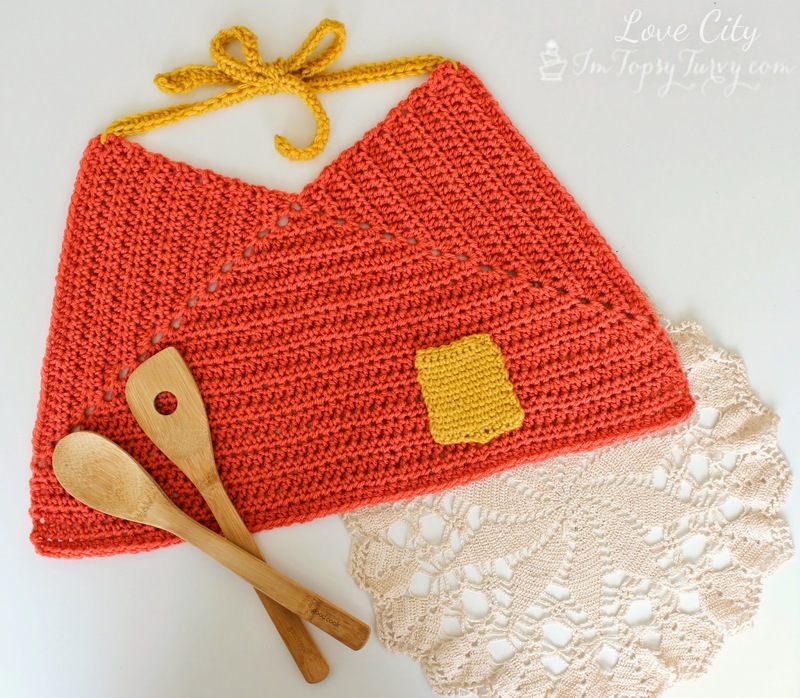 I made a fun crochet eyelet apron and the pocket is the perfect little edition! Make sure to stop by for the full free pattern!